Take a long look at that picture and tell me you wouldn’t want to be there right now. 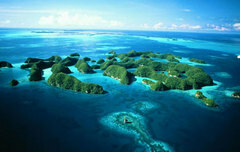 Aside from a season of Survivor, Palau remains mostly paradise on Earth. There’s an interesting phenomenon in Palau known as Jellyfish Lake. The lake, once open to the ocean, closed up allowing for an amazing reproduction of Jellyfish. On the flip side, the lake has a layer of hydrogen sulfide beneath the surface which, after coming into contact with, would make someone’s day pretty horrible.